It seems like each summer, I read another new novel by Jennifer Weiner. It goes without saying when you've read this many books by the same author, some are better than others. 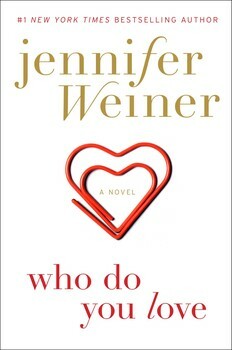 I am happy to say that her latest book, WHO DO YOU LOVE, was one of my favorites. I'm not sure it's quite as good as GOOD IN BED, but it's a touching love story with two memorable characters. WHO DO YOU LOVE follows the lives of Rachel and Andy from the time they first met in a hospital when they were just eight years old. Rachel has a serious heart problem which required her to spend a lot of time in the hospital, while Andy is in the emergency room with a broken arm after falling off a balcony. They immediately hit it off and bond over their feelings of isolation -- Rachel because she has a heart problem and Andy because he's biracial. After this initial meeting, they say their goodbyes and figure that they'll never see each other again. Wrong! Even though Rachel has a privileged upbringing in Florida and Andy lives in Philadelphia with his single white mom, they meet again as teenagers... and the bond is still strong. The two fall in love. Of course, their relationship isn't easy given that Rachel is a wealthy white Jewish girl and Andy is a bi-racial runner who lives in Philly. Over the next three decades, Andy and Rachel meet many times and realize that their bond and love for each other still runs deep. I read WHO DO YOU LOVE in a little over a day. It was extremely easy to read which makes it perfect for an end of the summer beach read, and I think that's because I liked the characters of Rachel and Andy so much. In fact, I loved both of these characters as well as their special relationship with each other. This novel definitely played with my heartstrings, though. Often times, I felt as if I were along for the ride with the many ups and downs of Rachel and Andy's lives. I liked Rachel (although she went through a period in college when I had some issues with her), but I absolutely loved Andy. I admit that I usually appreciate a female character in a novel like this; however, Andy was such a great character. From the start, my heart went out to him because he had such a sad situation. He was biracial and living in the poor parts of Philly. He never knew his father, his mother wasn't always the best, and he never felt like he fit in. The thing that saved Andy, though, was his love of running.. and it didn't hurt that he was really good at it. I'm talking Olympic good! I'll also argue that Rachel played a pretty important role in "saving" Andy too! I absolutely loved the dynamics of their relationship -- from the time they were kids, to when they were teens, to when they were adults. I thought the chapters that took place when they were teenagers were very well done. The way Ms. Weiner wrote about their relationship was so real and reminded me of pure teenage love. I also loved how she followed them to their college years when their relationship got much more complicated. In fact, I have to say that I felt so much of this story seemed real. I'm not sure if that's because the book was so well written or because I loved Rachel and Andy. Either way, it's a testament to the author for making me care so much about the characters and the story! I will say that this book played with my emotions... in a good way. Of course, I wanted Rachel and Andy to be together, but for much of the novel, they weren't. It was definitely interesting to see how they maintained relationships with other people as well as how they kept finding their way back to each other. Thankfully, the ending was perfect in my mind! WHO DO YOU LOVE would make a fun book club pick. There is a reading guide available with twelve questions along with some ideas to enhance your next meeting. Some of the themes you might want to explore include isolation, health factors, parent child relationships, dreams, relationships, self-identity, and love. You also might want to explore some of the symbols in the story like brokenness and healing. WHO DO YOU LOVE is a love story that's both entertaining and heartwarming. Highly recommended for fans of Jennifer Weiner and women's fiction. I read one of her books years ago and thought it was just okay. I'm beginning to think I read the wrong one. I know I've read books by Weiner, but I don't remember which ones. In any case, it's been a number of years. This one sounds really good, and I bet it would be a great book club book. This sounds interesting. I'm leary of novels where the white character "saves" the person of color but if written the right way it could be good. I think her books are good books to listen to in the car because they don't require so much concentration that I'll miss my turn!